We are a landscape design-build company. Here’s how we work. 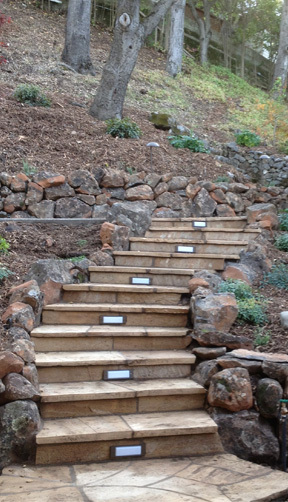 I have provided landscape design-build services to clients for over 25 years in our Santa Cruz and Monterey area. There are many names to sustainable landscape but my approach is to consider all the site-specific characteristics and conditions. I liaison my clients desires and the sensible aspects of a site including microclimate, soils, weather patterns, elevation, slope and naturally existing flora and fauna. My design goal is to create an aesthetic vision, a sense of space and a feeling of well being for my client in harmony with the existing characteristics of the site. We are a landscape design-build company which means I provide landscape designs, planting plans and project installation of my plans. My extensive knowledge of the industry and many years of installing landscape projects throughout Santa Cruz, Monterey, and Santa Clara Counties have allowed many challenges to my learning curve and the opportunity to utilize my knowledge in each new project. I work closely during installation with a skilled crew to insure peace of mind for my clients with little distraction and a successful and quality installation. Drought tolerant gardens need not look like dry land meadows in late summer. Possibilities are endless when creating gardens. Xeriscaping and sustainable methods can produce a many styles of landscape. Cottage gardens, Japanese style gardens, Contemporary or modern style gardens just to mention a few. Using low water use plants that thrive in our central coast and coastal area such as Succulents, California natives, tough Mediterranean and unusual Australian can be used in many landscape styles. Based on each individual plan a landscape might be considered drought tolerant and yet give the sense and appearance of green lush foliage through out the year. California is a dry state with unpredictable weather patterns. My landscape designs implement low use or no use of greedy water plantings, conserving water, using low water techniques, storing rainwater, utilizing gray water and eliminating additional costs and wasted energy and on any unnecessary yard maintenance and removing biomass. Without Natalain's creativity, knowledge and efficiency, our dream would not have become a reality. Her perfect design was beyond our dreams."